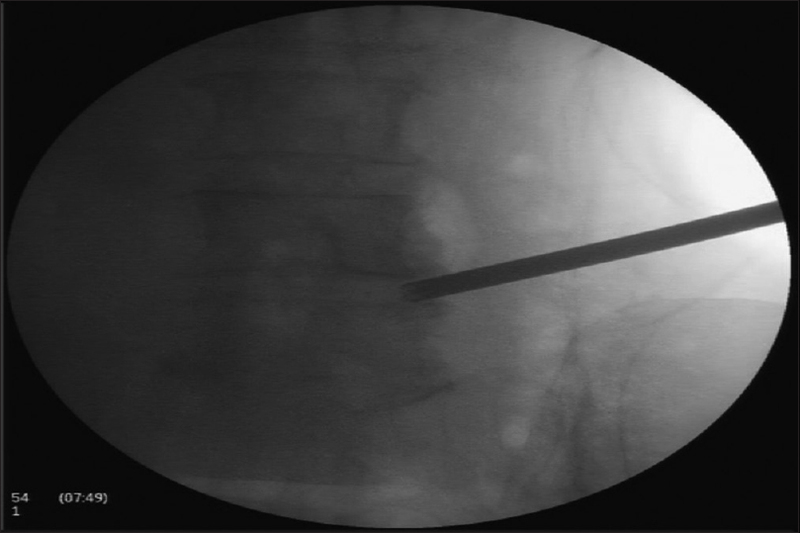 Background: Percutaneous transforaminal endoscopic surgery (PTES) constitutes an innovative method principally recruited for the treatment of lumbar disc herniation. Indication spectrum of PTES is constantly widened in current years. Hence, PTES has been proposed to represent a satisfactory alternative for the treatment of lateral recess stenosis (LRS), being defined as percutaneous endoscopic ventral facetectomy (PEVF) in these cases. The aim of this original study is to determine, for the first time in the literature, the outcomes of PEVF, especially in otherwise healthy nonelderly patients with LRS, alongside with special focus in health-related quality of life (HRQoL) assessment. Materials and Methods: Eighty-five otherwise healthy individuals from 58 to 64 years were diagnosed with LRS, being subjected to successful PEVF. 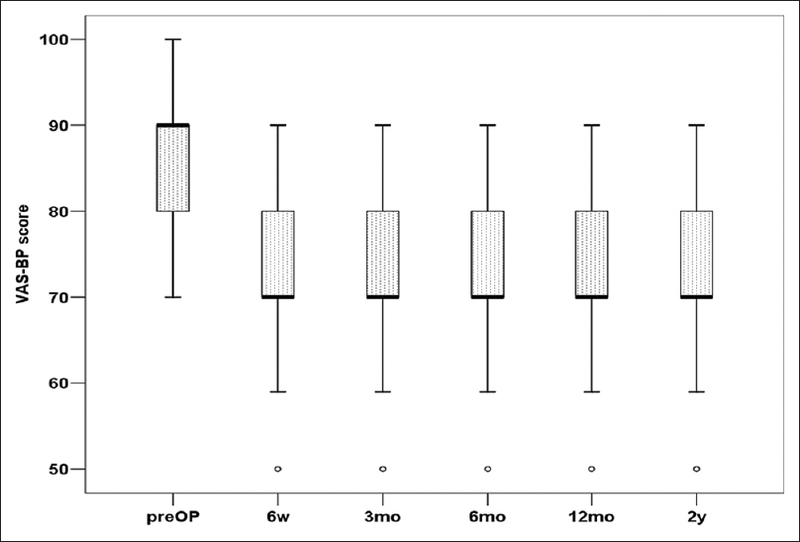 Patients were prospectively evaluated in 6 weeks, in 3, 6, and 12 months, and in 2 years postoperatively. Visual analog scales (VASs) were separately utilized for leg and low back pain evaluation (VAS-LP and VAS-BP, respectively), whereas Short Form-36 (SF-36) questionnaire was sequentially implemented for HRQoL assessment. 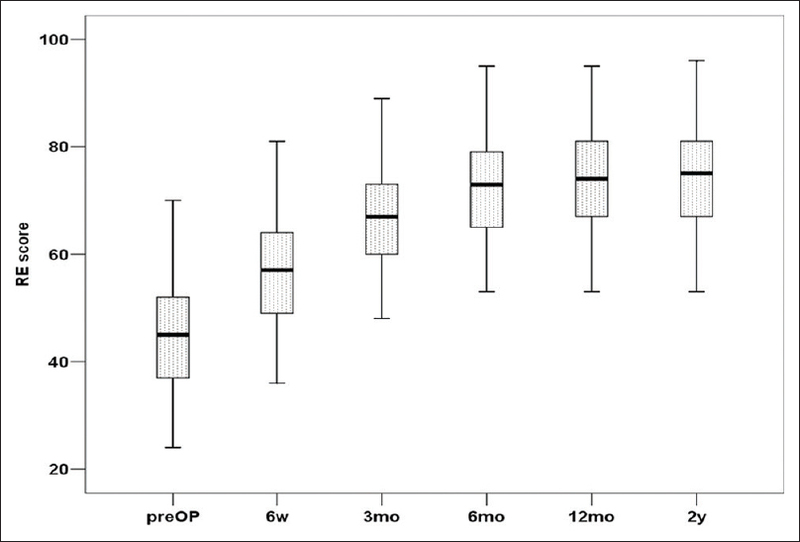 Results: All indexes of SF-36 as well as VAS-LP featured maximal amelioration in 6 weeks postoperatively, with subsequent further enhancement until 3 months and successor stabilization until 2 years. In contrast, VAS-BP presented minimal quantitative amelioration in 6 weeks, featuring no additional alterations. Values of all indexes in all follow-up intervals were demonstrated to be statistically significant in comparison with preoperative values (P < 0.05). No remarkable differentiation was observed between distinct parameters of SF-36. Conclusions: PEVF implementation in nonelderly patients with LRS was displayed to be safe and effective, providing alongside considerable improvement in HRQoL 2 years postoperatively. LSS treatment is initially conservative including spine injections, physical therapy, as well as administration of analgesics. However, conservative treatment failure, especially when accompanied by pain and functional limitation, establishes the option of surgery., In these cases, open decompression surgery with laminectomy and foraminotomy is conventionally performed. Nevertheless, the existence of notable complications limits the safety and effectiveness of these selections. The aim of this paper is to report particular outcomes of PEVF for LRS utilizing Transforaminal Endoscopic Surgical System (TESSYS) technique and including only nonelderly patients with the absence of comorbidities. Furthermore and for the first time in the literature, specific data about patients' health-related quality of life (HRQoL) are provided. These traits in conjunction with the considerable sample utilized underline the originality of our study. In this study were only nonelderly individuals enrolled. All patients were under the age of 65 years (58–64 years), being diagnosed with LRS according to clinical and radiologic criteria. Furthermore, they were otherwise healthy, featuring no comorbidities. All patients fulfilled all the indications for conventional open decompression surgery, being referred to the same spine surgeon (KS). Patients were thoroughly informed about study's primary aim, deciding to sign a fully informed written consent. Institutional review board of the hospital as well as local ethics committee administrated a special approval. Moreover, all aspects of this study were in absolute conformity with Ethical Principles for Medical Research Involving Human Subjects, as defined in Helsinki Declaration of 1975 and as revised in 2000. Inclusion criteria were as follows: (i) radiculopathy, (ii) neurogenic claudication, (iii) sensory or motor neurologic deficit, (iv) LRS especially due to excessive osseous growth and less due to yellow ligament hypertrophy/ossification, as confirmed by magnetic resonance imaging (MRI) of the lumbar spine, in compliance with clinical findings, and (v) failure of 12-week typical conservative treatment (analgesic administration, spinal injections as well as physical therapy sessions). Exclusion criteria were as follows: (i) noncontaminated disc hernia exceeding the one-third of the spinal canal on the sagittal MRI scans, (ii) sequestration of the disc, (iii) recurrent herniated disc or previous surgery at the affected level, (iv) segmental instability or spondylolisthesis, (v) vertebral fracture, (vi) spinal tumor or infection, (vii) elderly patients (over the age of 65 years), and (viii) presence of comorbidities as coronary insufficiency, heart failure, diabetes mellitus, and respiratory failure. This study was prospectively designed, enrolling eighty-five individuals. All patients were subjected to PEVF through transforaminal route in 2015–2016. 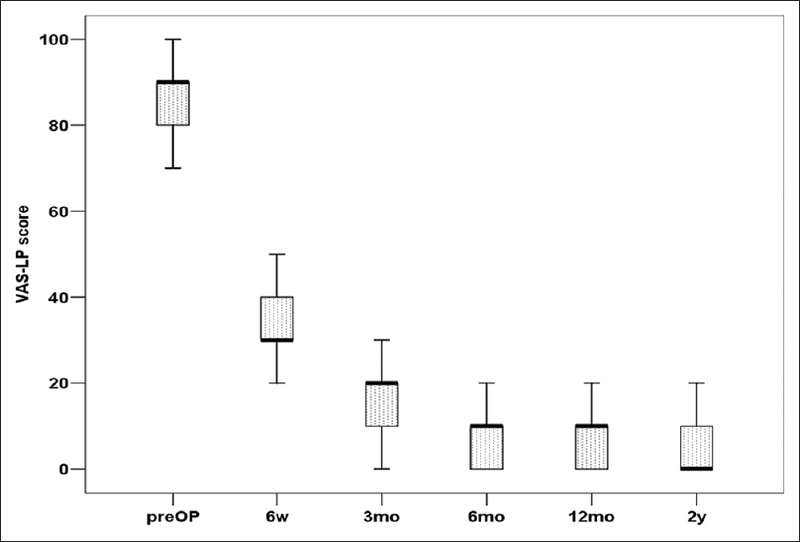 Patients were assessed preoperatively as well as in 6 weeks, in 3, 6, and 12 months, and in 2 years postoperatively. Especial clinical scales were utilized for patients' health objective assessment. Visual analog scale (VAS) was utilized for leg and low back pain (VAS for leg pain, VAS-LP, and VAS for back pain, VAS-BP, respectively). Moreover, Short Form 36 Health Survey (SF-36) Questionnaire was recruited for HRQoL evaluation. All patients enrolled in this study underwent full-endoscopic ventral facetectomy with TESSYS method by the same spine surgeon. Technique was performed under local anesthesia and mild sedation. Preoperative position of patients was lateral decubitus, lying down on the opposite side, in order to accomplish optimal amplification of foraminal space. Surgical field disinfection in conjunction with injection of local anesthetic at the point of needle introduction (in a lateral position 11 cm from midline) was conducted. Needle was gradually forwarded under constant fluoroscopic guidance, in order to verify its precise position [Figure 1]. Implemented angulation was more cranial in comparison with endoscopic discectomy procedure. Transit corridor led in Kambin's triangle (safe zone). After fluoroscopic verification of correct position, three distinct reamers with gradually increasing diameters (5.5, 6.5, and 7.5 mm, respectively, joimax® system) were sequentially applied, achieving therefore adequate foraminotomy [Figure 2]. Introduction of reamers was accompanied by analgesia (fentanyl ampule) and mild sedation administration by the anesthesiologist. Cannula and endoscope were finally inserted. Hence, osseous decompression of the lateral recess by conducting ventral facetectomy was achieved [Figure 3]. All patients were discharged on the first postoperative day. Nevertheless, two of them (2.4%) featured temporary postoperative dysesthesia in distribution of exiting nerve root (L5), being entirely retreated in 6 weeks with conservative treatment. VAS constitutes a facile and accurate method for the evaluation of pain intensity. In our study, a unipolar horizontal line of 100 mm was recruited. Patients were asked to demonstrate the level of realized pain with a point. VAS was distinctly for leg and low back pain (VAS-LP and VAS-BP, respectively) acquired in each interval assessment. All scores were estimated in millimeters (mm), recruiting a one-decimal place approach. 9 mm was defined as the level of lower clinically significant alteration. Concomitant parameters as pain etiology, age, and gender were not separately investigated. SF-36 Medical Health Survey Questionnaire is thoroughly implemented for the evaluation of HRQoL in spine surgery. SF-36 is composed by 36 different objects, evaluating totally 8 parameters in regard to patients' generic health and daily life conditions; physical function, role-physical, bodily pain, general health, energy, fatigue, and vitality, social function, role-emotional, and mental health. The appropriately formed questionnaire was completed from all patients in every follow-up interval. Results were subsequently collected and edited, in order to be represented by a percentage. In all studied indexes, higher score is associated with auspicious HRQoL. Questionnaires were considered invalid if less than half of form entries were checked. Statistical processing of compiled data was performed with statistical package SPSS, version 23.00 (SPSS Inc., Chicago, IL, USA). Continuous variables were calculated as mean ± standard deviation. In contrast, categorical variables were represented by specific percentages. Statistical correlation of continuous indexes was achieved with Student's t-test, in the case of normal distribution presence. Otherwise, Mann–Whitney test was employed. P = 0.05 instituted the level of statistical significance. All utilized scores were evaluated preoperatively and regularly in all intervals of follow-up. All patients successfully completed the end of follow-up. Demographic features of recruited patients are provided in [Table 1]. 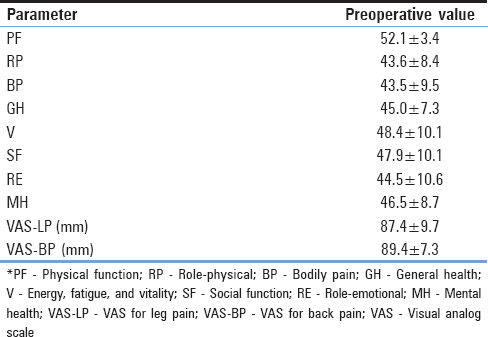 Preoperative values of all indexes are presented in [Table 2]. The overwhelming majority of indexes featured a similar amelioration pattern. Major improvement was recorded in 6 weeks, with a subsequent enhancement until 3 months. Minimal improvement of parameters was thereafter until 6 months observed, with further stabilization until 2 years [Figure 4] and [Table 3]. VAS score assessment revealed though a remarkable differentiation. VAS-LP index featured maximal enhancement at 6 weeks, with relatively less amelioration after 3 months. 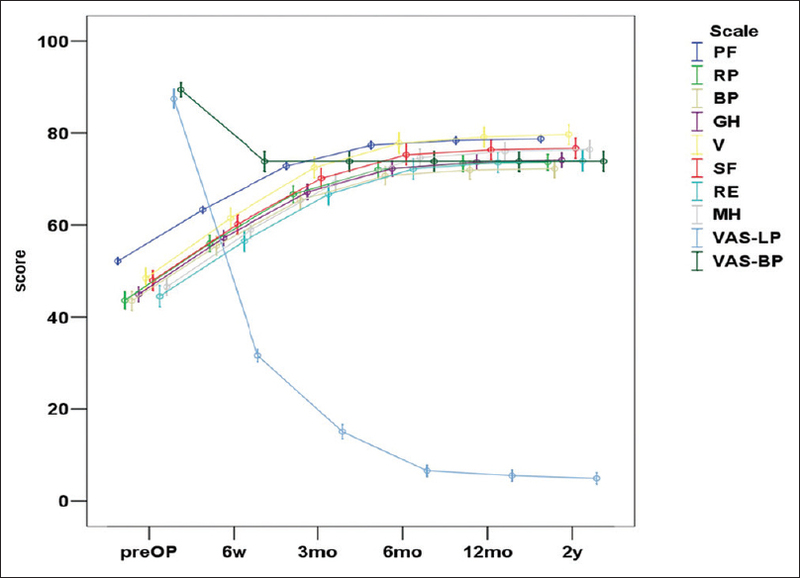 Sequent minimal improvement at 6 months with further stabilization was observed [Figure 4], [Figure 8] and [Table 3]. Statistical significance was recorded for value alteration in all follow-up intervals [Table 3]. In contrast, VAS-BP index was associated with statistically significant betterment at 6 weeks, presenting no alterations thereafter [Figure 4], [Figure 9] and [Table 3]. LSS constitutes an especial clinicoradiologic syndrome. Typical clinical manifestations include neurogenic claudication and radiculopathy, being classically associated with CS and LRS/FS respectively. Nevertheless, accompanying symptoms as low back pain, paresthesias, and/or gait limitations may be present.,,, The conjunction of open decompression with fusion has been proposed as an efficient solution for surgery-related low back pain recession, in order to accomplish a more favorable postoperative clinical course. LSS diagnosis is currently ratified by radiologic assessment with MRI. However, severity of imaginary findings is not always consistent with clinical manifestation intensity. Andrasinova et al. performed an observational radiological study, enrolling 84 patients with CS. The radiologically defined degree of stenosis was not concluded to be correlated to pain intensity or functional disability, demonstrating thus the complexity of the syndrome. This mismatch of clinical with radiologic data may be an outcome of the routine conventional conduction of MRI examination in the supine position. Upright MRI may be alternatively implemented in order to attain a more realistic evaluation of neural compression. After the first introduction of Yeung in 2007, further studies were conducted in order to delineate the precise importance of PTES in LRS surgical management.,, In all these studies were patients in a large age range, including nonelderly, recruited. Lewandrowski performed a wide retrospective study, enrolling 220 patients with age range 35–85 years. The aim of this study was to illustrate the precise role of PTES in lateral spinal stenosis with or without the concomitant presence of LDH. It was concluded that PTES utilizing the outside-in technique was incompetent to achieve adequate decompression in the lateral recess. Patients with stenosis in the entry foraminal zone (which was defined to be in absolute concordance with LRS) featured clinical failure. Results of Lewandrowski's study were determined to be opposed to these of next studies. Li et al. prospectively studied 85 patients with the age range from 46 to 78 years (mean: 56.7 years). All recruited patients were diagnosed with LRS, whereas attendant LDH was present in 56 cases. Percutaneous endoscopic lumbar foraminoplasty with subsequent decompression was conducted in all cases, whereas patients were followed up for 2 years. VAS for low back and lower limb pain and Oswestry Disability Indexes (ODIs) were found to be significantly improved in all follow-up intervals. Furthermore, the overwhelming majority of evaluated patients (77 patients, 90.6%) featured favorable outcomes (“excellent”/“good”) according to MacNab criteria assessment. Hence, PTES with foraminoplasty and decompression was advocated to represent a safe and effective alternative for LRS surgical management. Singh et al. also investigated the role of PTES in the surgical treatment of LSS. Sixty-seven patients with age over 60 years (mean: 68.3 years) were retrospectively evaluated; 22 of them were operated for LSS, while the other 45 for LDH. VAS for lower limb and low back pain as well as ODI scores were statistically significantly postoperatively improved. Moreover, 76.1% of patients featured “excellent”/“good” outcomes according to MacNab score assessment. PTES was concluded to constitute an effective technique for LSS treatment, as results after implementation of PTES for LSS were not significantly differentiated from the cases where PTES was utilized for LDH. However, anatomic type of LSS in recruited patients was not determined. Outcomes of these studies are in general concordance with our data. We prospectively studied 85 patients subjected to PEVF with TESSYS technique for LRS. 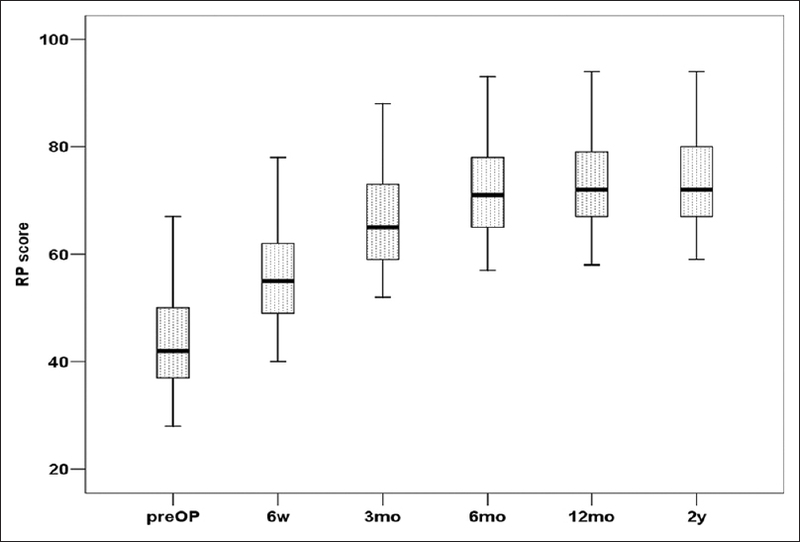 VAS-LP and VAS-BP were statistically significantly enhanced 6 weeks postoperatively. However, VAS-LP continued to feature less quantitative improvement at 3 months and 6 months, presenting a subsequent stabilization. In contrast, no alterations after 6 weeks were observed for VAS-BP index. 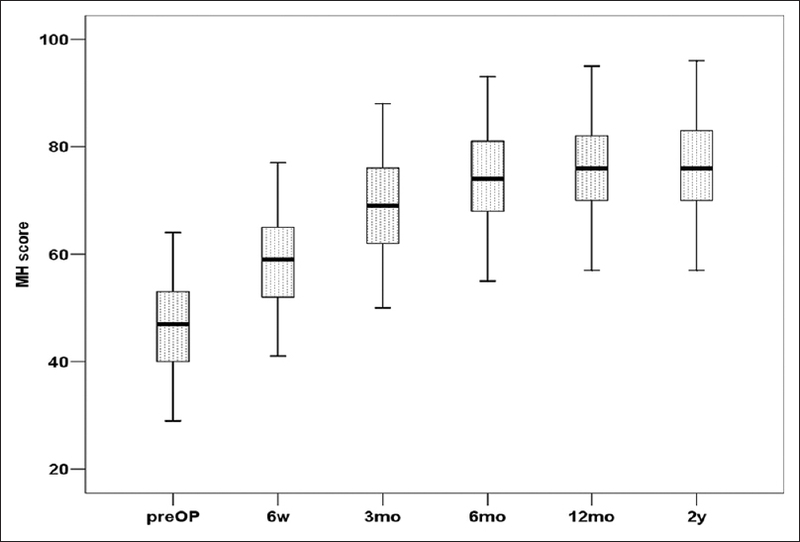 A minimal only recession of back pain was after PTES recorded, theorizing the comparatively with VAS-LP minimal improvement of VAS-BP in 6 weeks. This considerable differentiation of VAS score amelioration may be related to the existing degenerative lumbar spine disease. All patients enrolled in our study presented LRS, primarily due to the abnormal and extensive osseous growth. Degenerative alterations were though diffusely present in lumbar spine radiologic evaluation. PEVF sought to decompress dorsal root ganglia and nerve roots in only one level, where nerve impingement was clinically and radiologically identified. Restoration of spinal elements' physiological anatomy was impossible to be conducted. Hence, satisfactory osseous decompression of nerve elements in lateral recess was clinically associated with momentous amelioration of lower limb pain. On the contrary, the presence of diffusely distributed degenerative pathologic alterations constituted, to our point of view, the primary etiology for the low decline of low back pain. Furthermore, SF-36 questionnaire was recruited in order to assess HRQoL of our patients. We advocate that pain constitutes a fundamental parameter with considerable impact in daily routine. However, individual calculation of pain is more likely unable to represent the favorability or not of the daily routine circumstances. Therefore, SF-36 was decided to be included in our assessment armamentarium. All parameters of SF-36 were statistically significantly improved in all follow-up intervals. Absolute quantitative amelioration of values was maximal at 6 weeks, being almost equal until 3 months and less until 6 months. Subsequent stabilization until the end of follow-up was observed for all parameters. Comparative evaluation of individual parameter enhancement did not reveal any noteworthy differentiation. Hence, PEVF achieved statistically and clinically significant amelioration of all parameters of HRQoL in patients with LRS. Selection of enrolled patients in conjunction with HRQoL evaluation and sample size delineates the originality of our study. All evaluated patients were nonelderly, featuring no comorbidities. No other study focused on this age range, in order to clarify the role of PTES in LRS surgical management. We have conducted this differentiation, in order to acquire safer and more accurate conclusions about PTES usefulness. Co-existing diseases are more frequently in elderly individuals encountered; these conditions are associated with significant effects in patients' HRQoL. Moreover, comorbidities are often severe, automatically excluding these patients from the potentiality of general anesthesia administration and open decompression surgery conduction. PEVF may then represent a potential alternative for LRS surgical treatment. In our study, nonetheless, enrolled nonelderly patients featured no comorbidities. Open decompression surgery with laminectomy and foraminotomy would represent the currently appropriate surgical selection. Nevertheless, experience in PTES conduction, outcomes of relevant studies in recent literature, thorough deliberation with the radiologists focusing on the precise anatomy and primary etiology of LRS in each case as well as the categorical denial of patients to be subjected to open decompression surgery under general anesthesia allowed us to perform PEVF. To our point of view, the absence of comorbidities in these otherwise healthy individuals verifies the reliability of our results. Enhancement of all parameters of SF-36 instituted a pure demonstration of PEVF favorable outcomes in HRQoL, which was affected from no other factors, as the involving comorbidities. To the best of our knowledge, this is the first study in recent literature to evaluate the outcomes of full-endoscopic ventral facetectomy recruiting only nonelderly otherwise healthy individuals with LRS, adding alongside HRQoL assessment. PEVF was centrally displayed to constitute a promising alternative over conventional laminectomy and foraminotomy for LRS surgical management. VAS scores (especially VAS-LP) and all parameters of HRQoL were recorded to be statistically and clinically notably ameliorated in the end of follow-up at 2 years. To our point of view, the relatively limited follow-up evaluation constituted the primary limitation of our study. Nevertheless, no studies in the current literature have reported particular outcomes for transforaminal full-endoscopic surgery in nonelderly patients. Hence, further multicenter studies with larger samples and more extended follow-up evaluation are required, in order to delineate the precise role of full-endoscopic ventral facetectomy in LRS surgical treatment in nonelderly otherwise healthy individuals. Dr. Kapetanakis is a reference doctor for joimax® GmbH and receives payments for teaching. The other authors have no conflicts of interest to declare. Maeda T, Hashizume H, Yoshimura N, Oka H, Ishimoto Y, Nagata K, et al. Factors associated with lumbar spinal stenosis in a large-scale, population-based cohort: The Wakayama spine study. PLoS One 2018;13:e0200208. Lafian AM, Torralba KD. Lumbar spinal stenosis in older adults. Rheum Dis Clin North Am 2018;44:501-12. Poetscher AW, Gentil AF, Ferretti M, Lenza M. Interspinous process devices for treatment of degenerative lumbar spine stenosis: A systematic review and meta-analysis. PLoS One 2018;13:e0199623. Thornes E, Robinson HS, Vøllestad NK. Dynamic balance in patients with degenerative lumbar spinal stenosis; a cross-sectional study. BMC Musculoskelet Disord 2018;19:192. Ahn Y. Percutaneous endoscopic decompression for lumbar spinal stenosis. Expert Rev Med Devices 2014;11:605-16. Doualla-Bija M, Takang MA, Mankaa E, Moutchia J, Ongolo-Zogo P, Luma-Namme H, et al. Characteristics and determinants of clinical symptoms in radiographic lumbar spinal stenosis in a tertiary health care centre in sub-Saharan Africa. BMC Musculoskelet Disord 2017;18:494. Maugeri R, Basile L, Gulì C, Banco A, Giordano G, Giugno A, et al. Percutaneous pedicle-lengthening osteotomy in minimal invasive spinal surgery to treat degenerative lumbar spinal stenosis: A Single-center preliminary experience. J Neurol Surg A Cent Eur Neurosurg 2018;79:365-71. 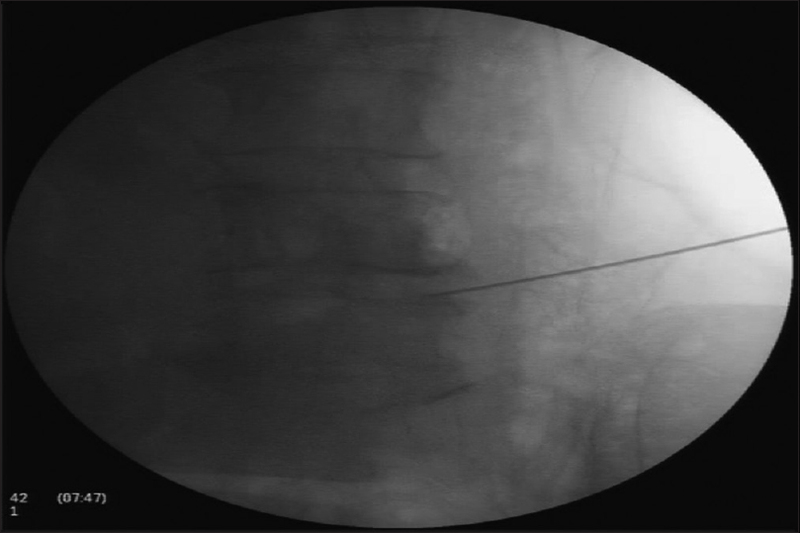 Tacconi L, Spinelli R. Lumbar canal stenosis: Can we treat it endoscopically? Our experience. J Neurosurg Sci 2018. [Ahead of print]. Kapetanakis S, Giovannopoulou E, Charitoudis G, Kazakos K. Transforaminal percutaneous endoscopic discectomy for lumbar disc herniation in Parkinson's disease: A Case-control study. Asian Spine J 2016;10:671-7. Kapetanakis S, Charitoudis G, Thomaidis T, Theodosiadis P, Papathanasiou J, Giatroudakis K, et al. Health-related quality of life after transforaminal percutaneous endoscopic discectomy: An analysis according to the level of operation. J Craniovertebr Junction Spine 2017;8:44-9. Kapetanakis S, Gkantsinikoudis N, Chaniotakis C, Charitoudis G, Givissis P. Percutaneous transforaminal endoscopic discectomy for the treatment of lumbar disc herniation in obese patients: Health-related quality of life assessment in a 2-year follow-up. World Neurosurg 2018;113:e638-49. Yeung AT. The evolution and advancement of endoscopic foraminal surgery: One surgeon's experience incorporating adjunctive techologies. SAS J 2007;1:108-17. Sairyo K, Chikawa T, Nagamachi A. State-of-the-art transforaminal percutaneous endoscopic lumbar surgery under local anesthesia: Discectomy, foraminoplasty, and ventral facetectomy. J Orthop Sci 2018;23:229-36. Lewandrowski KU. “Outside-in” technique, clinical results, and indications with transforaminal lumbar endoscopic surgery: A retrospective study on 220 patients on applied radiographic classification of foraminal spinal stenosis. Int J Spine Surg 2014;8:26. Li ZZ, Hou SX, Shang WL, Cao Z, Zhao HL. Percutaneous lumbar foraminoplasty and percutaneous endoscopic lumbar decompression for lateral recess stenosis through transforaminal approach: Technique notes and 2 years follow-up. Clin Neurol Neurosurg 2016;143:90-4. Singh R, Zeng Xin G, Hirachan MP, Yu Cheng L. Outcome of percutaneous transforaminal endoscopic lumbar surgery in & >60-year-old patients with low back pain. Asian Spine J 2018;12:511-7. Powell JB, Gach JE. Phototherapy in the elderly. Clin Exp Dermatol 2015;40:605-10. Kambin P, Brager MD. Percutaneous posterolateral discectomy. Anatomy and mechanism. Clin Orthop Relat Res 1987;223:145-54. Lee JJ, Lee MK, Kim JE, Kim HZ, Park SH, Tae JH, et al. Pain relief scale is more highly correlated with numerical rating scale than with visual analogue scale in chronic pain patients. Pain Physician 2015;18:E195-200. Kelly AM. Does the clinically significant difference in visual analog scale pain scores vary with gender, age, or cause of pain? Acad Emerg Med 1998;5:1086-90. Zanoli G, Jönsson B, Strömqvist B. SF-36 scores in degenerative lumbar spine disorders: Analysis of prospective data from 451 patients. Acta Orthop 2006;77:298-306. Andrasinova T, Adamova B, Buskova J, Kerkovsky M, Jarkovsky J, Bednarik J, et al. Is there a correlation between degree of radiologic lumbar spinal stenosis and its clinical manifestation? Clin Spine Surg 2018. [Ahead of print]. Lønne G, Fritzell P, Hägg O, Nordvall D, Gerdhem P, Lagerbäck T, et al. Lumbar spinal stenosis: Comparison of surgical practice variation and clinical outcome in three national spine registries. Spine J 2018. pii: S1529-9430(18)30253-5. Lang G, Vicari M, Siller A, Kubosch EJ, Hennig J, Südkamp NP, et al. Preoperative assessment of neural elements in lumbar spinal stenosis by upright magnetic resonance imaging: An implication for routine practice? Cureus 2018;10:e2440. Lee CH, Choi M, Ryu DS, Choi I, Kim CH, Kim HS, et al. Efficacy and safety of full-endoscopic decompression via interlaminar approach for central or lateral recess spinal stenosis of the lumbar spine: A meta-analysis. Spine (Phila Pa 1976) 2018. [Ahead of print].